Beyoncé's tour announcement wasn't the only pleasant surprise for Twin Cities viewers last night during halftime in the Super Bowl. In a prime slot at the start of the break, WCCO aired a Taco Bell commercial with Minneapolis' "best looking man in comedy" Fancy Ray McCloney that was inspired by -- and doubled as -- a promotion for Minneapolis' beloved indie LP shop Treehouse Records. 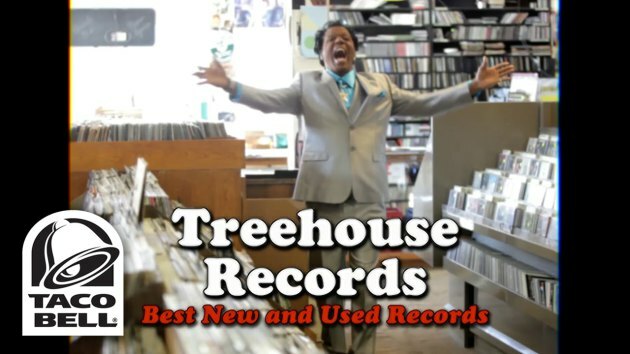 "Hi, this Fancy Ray for Treehouse Records, where we pay more cash for your dusty old records!" the clip starts out. It then shows the comedian donning different outfits to trumpet the store's selection of gospel, jazz and "Viking metal" (read: Scandinavian death metal). Ray even holds up a record by one of the store's favorite acts, former Jayhawks co-leader Mark Olson. It's not until McCloney hoists a second LP do we see he is really shilling for a new shelled item from the fast-food chain. "The only thing bigger than our selection is Taco Bell's new Quesalupa," he says as he hoists an album cover with the Taco Bell logo on it, and then proceeds to pull one of the cheesy new menu items out of the LP jacket. The commercial -- which only aired locally but is part of a national campaign -- was based on an actual TV spot that Treehouse Records made with McCloney back in 2012. It's one of many low-budget but high-energy small-screen ads the veteran comic and pitchman has created over the years for small Twin Cities businesses, including So Low Grocery, Hy’s Pawn & Jewelry and the adult bookstore Lickety Split. "This really is a validation of all the work I've done all these years making these wacky but smart, attention-grabbing commercials," McCloney said Monday morning, answering one of many phone calls since the ad aired. He called the backstory of the new commercial "a bit of a roller-coaster ride," since he was first approached to do it by Los Angeles ad firm Deutsch Inc. more than two months ago but only just filmed it two weeks ago. Deutsch shot similar ads with local TV figures in four other markets. “We scoured the Internet and found some of the most famous and beloved local advertisers, including Fancy Ray. He’s a local legend and one of the premier pitchman for local businesses, not to mention he’s hilarious, so we thought he’d be a perfect fit,” Craig said. The ad is not scheduled for another TV spot, but McCloney is holding out hope the ad will live on, possibly even on a national level. “They’re saying they’re real excited about it, so we’ll see,” he said. In the end, Fancy Ray said, "It was remarkably easy. I just had to show up and deliver my lines, which I was born to do" (as opposed to his own commercials, where he's also in charge of all the logistics). The commercial will now be touted online but was only scheduled to air once on TV. McCloney is holding out hope it will live on, possibly even on a national level. "They're saying they're real excited about it, so we'll see," he said. Taco Bell paid for the ad, and Treehouse got a location fee out of it -- in addition to the obvious exposure it will bring. Treehouse owner Mark Trehus was quick to point out on Facebook last night, "There are plenty of Mark Olson's latest LP for anyone who wonders why I decided to feature it." He forgot to mention the nearest Taco Bell to his Lyndale Av. and 26th St. store. Taco Bell was not the only company to capitalize on local audiences. Automaker Subaru, with the help of Minneapolis agency Carmichael Lynch, aired a 30-second spot for its “Dog Tested. Dog Approved.” campaign that showed a golden retriever driving around a sleepy puppy. The ad was played regionally in 10 markets during the live broadcast and in the pregame broadcast in Minneapolis. Some of the reasons that companies may choose to advertise regionally are if their business is limited geographically to a certain area, if they are trying to appeal to a key market or if they are trying to spend less money than they would for a national spot, said Neil Goodspeed, director of consumer engagement at Carmichael Lynch. “The interesting thing for me that I’m seeing is that social media can be a great equalizer when it comes to local and national [ads],” Goodspeed said. When people are commenting on social media about an ad or viewing an ad, it is hard to tell where it ran and it ultimately doesn’t matter, he said. Here's the commercial that aired last night along with the original 2012 posted underneath it.